-After going to the mailroom to buy a stamp for a letter, I realized that no one was there for me to buy stamps from. When looking for my keys to leave, I found an old forgotten stamp in my bag. 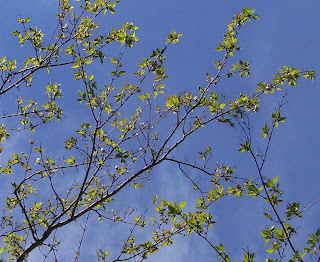 -The new bright green leaves on a tree contrasting with the blue sky. -I went on a pastoral visit today to a woman minister, who graduated from Union Seminary in New York in 1958. She was one of the earliest women to be ordained, and spoke of her favorite professor, "Reinie." It turns out "Reinie" is Reinhold Niebuhr, one of the most influential theologians of the 20th century. His work is foundational to ethics courses taught at many seminaries, including mine. I hope I get to visit her again soon. 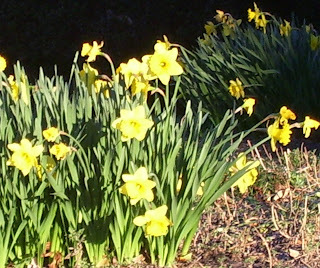 -Lovely yellow daffodils along the road that, coupled with warm weather, usher in Spring. -The little girl walking around with two Barbies hanging out of her mouth. She was about 3, and was chewing on their feet. It was the most bizarre and hilarious thing I've seen in a while. -Feeling exhausted and knowing that I've earned my sleep tonight. -Starting my day with coffee and my Breakfast at Tiffany's record. What a great way to ease into another Monday. -When my theology professor began her lecture on the Holy Spirit, a fellow student (Andy) marched in dressed in full Ghostbuster regalia, complete with a Proton Pack. He announced, "I hear we have a ghost or spirit problem here." The whole class erupted into laughter, and then my professor dubbed the event "an appropriate Presbyterian response: exterminate the Holy Spirit." We laughed even more. -Getting accepting into the Clinical Pastoral Education program at Grady Hospital in Atlanta for the summer. It's going to be intense and challenging, but I'm so excited. -Swinging on a swing with the wind blowing through my hair for the first time in ages. What a liberating feeling. -Seeing members of Eastminster tear up as Robert talked about his call and faith as he was assessed for Candidacy for the ministry. I could tell they all felt responsible (as they should) for helping him to this point. -Talking with Mel, my friend who worked in Belfast with me, about the relevance of seminary to our sometimes traumatic Belfast experience. I had a sudden epiphany: seminary matters because it shows me that God matters, and that what I say about God matters. A middle-aged man involved in paramilitaries that sees justice as abusing and disfiguring a teenage "delinquent" has a skewed view of God's justice. It matters that I tell him that God is a God of love, not vengeful punishment. It matters that I tell him that all people, including himself and the teenager, are beloved children of God. What we say and think about God, however subconscious, matters. Always. 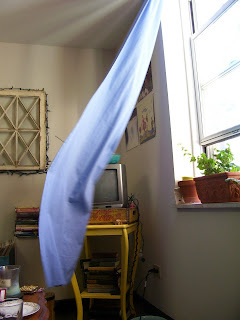 -The way the breeze blowing through my open window sent the curtains dancing. They looked so graceful caught up in the wind. -Watching Jae and Jimmy play rock, paper, scissors in the bookstore, and laugh as they won or lost. -The sound of my friends singing in Columbia's choir at chapel this morning. Their joy showed on their faces and in their voices. -An email from Kate, including the lyrics to "Loving Hands" by Christine Kane. It's a song about appreciating the "glimpses of grace" in every day. -Making my family's pea salad to celebrate a Spring-like day. It's a delicious cool combination of young peas, red onion and smoked gouda cheese. It just tastes like spring, and brings back memories of picnics and time together. -Going an a Clothes Closet (our free seminary resale shop) expedition with Karen and Erin. 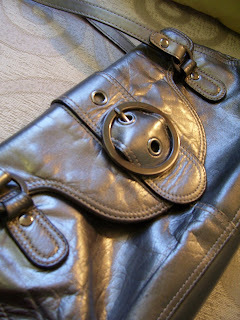 I found a great metallic silver bag that I adore. -Glancing at the hymnal in front of me during the Ash Wednesday service and seeing "God is love" written in a child's scrawl along the edge of the pages. If children learn nothing else in church, this is enough. What would the world be like if all graffiti bore such words? -Having Beverly at church tell me, "You are called." In a stressful and sometimes frustrating time of discernment and classes, it is good to hear those words. 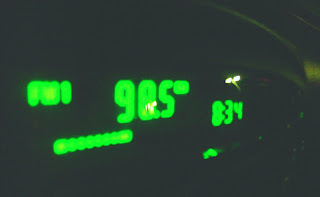 -Hearing a song on the radio with the exact words that I was needing to hear at that moment. -Falling asleep with the cool breeze from my window wafting through my room. For some reason, an open window at night always reminds me of my pensione in Italy, where the tiny, open window carried in cool air and phantom music. -Logan telling me all about how she made elf houses with her friends last weekend. I did the exact same thing at her age. It brought back whimsical memories to listen to her talk about what bark she used and how big they were. 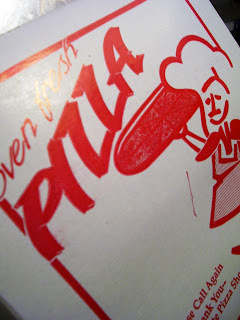 -Finally coming home, starving, and running into Sandra, who was going to get pizza. She invited me along, and what was going to be a quick make-do solo dinner turned into refreshing conversation and fabulous pizza. -Dancing out frustration with my liturgical dance group. Dance is the greatest stress relief. -Enjoying 2 1/2 hours of coffee and conversation with Leslie this afternoon. 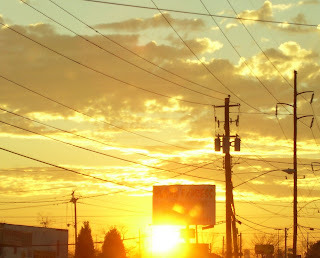 -The last bright yellow rays of sunlight before the sun began to set. -In my sermon this morning, I mentioned my glimpses of grace, which prompted a couple of women to come up to me after and share their recent "glimpses" with me. 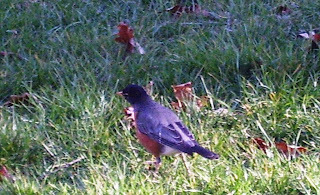 One woman spoke of the return of robins to Georgia, and how that's always a hopeful sign that Spring is near. I hadn't noticed them before, but when I went outside this afternoon, there were six of them playing in the grass. -Having five great friends from seminary show up to hear me preach. It was such a comfort to see their faces smiling at me. This was the first time I've worn a robe and stole to preach, and it felt surreal and exciting. -The buttery, melt-in-my-mouth pieces of avocado in my tortilla soup at lunch. It was warm and delicious--the perfect choice for such a frigid day. "read here and dream a while with me..."
-Finding a great old book on the free book table in Campbell Hall. 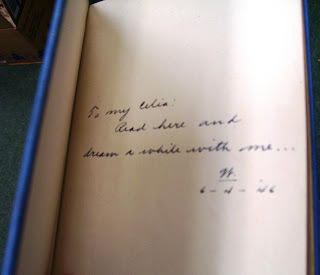 It's called Bequest of Wings by Annis Duff, and the inscription hand-written on the inside cover reads, "To my Celia: Read here and dream a while with me... W. 6-4-'46." I wonder what Celia and W's story is. They must have been very happy. -A wink from Mama C. (as we affectionately call her) in the refectory at lunch. -The surprised faces of three youth when they saw Leslie and me at their 6th grade band concert last night. -Wearing my Grandmother's black beads today. I love things with a history, especially a family history. 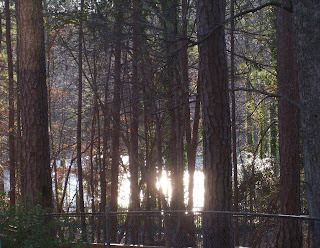 -Noticing the lake that lies through the trees below the church for the first time, because the sun was reflecting off of its surface. The sparkling light caught my eye. -Laughing at Delilah, the self-proclaimed "Sappy Love Song Queen" on the radio with Erin on the way home. 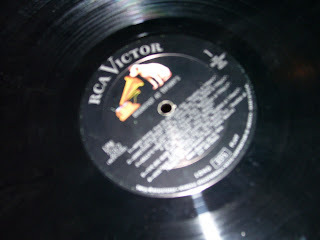 We sang cheesy songs at the top of our lungs and ridiculed the awful* grammar in the love songs (like "just you and I"). -Getting a care package from my parents, including the most fantastic pop-up book I've ever seen. It's called Blue 2 by David A. Carter, and on each page you have to find the blue number 2 within the design of the whimsical pop-ups. It's great fun for children of all ages. -Sitting outside in the warm sunlight at Eastminster to do my exegesis for next Sunday's sermon. -The cute older woman in the gym who walked up to the bicycles with a walker adorned with large "Happy Birthday" balloons. When I was leaving, I overheard two workers say, "Look at Mertyl, she's amazing. Isn't she ninety-five today?" 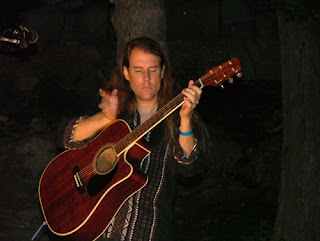 -Hearing David Lamotte play at Columbia last night. I first heard him at College Connection at Mo Ranch in Texas many years ago, and have heard him several times since. His songs spoke to me during my most formative years of college and again when I keynoted at College Connection last year, so hearing and seeing him reminds me of lovely Mo Ranch and friends I miss. One thing he said last night really resonated with me: "If you want to fight hatred, you can't fight it with hatred. You have to pour enough love on it until it goes out." -After accidentally locking myself into Margaret's bathroom, I had the entire group of friends come to my rescue. Will even wrote a funny song about it after I was freed. -During a baptism today, Arch specifically addressed the children of the congregation, asking them to help the child up when he falls down and to teach him about Jesus. When prompted to say "I will," one child was so zealous that she kept shouting out "I will!," even during a prayer. I wish I had that sort of eagerness. -Lyrics from Jennifer Daniels' song "Stay": "You dream about a better day that's coming, and realize it's already on its way..." It's a great enunciation of Christian eschatology (the already and not yet of the kingdom of God), or just soothing words for someone (i.e. me) trying to live fully in the present while anticipating the future. -The little boy in the grocery store decked out in full knight regalia, complete with a plastic shield and sword. 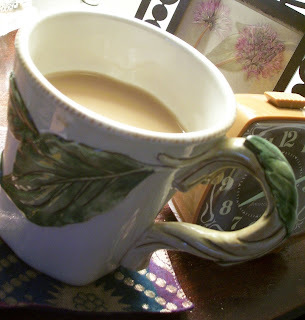 -The sweet delicious taste of caramel tea. 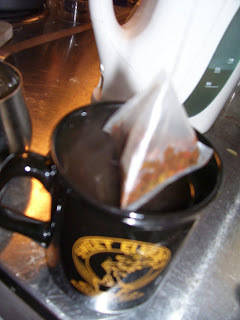 Its smooth and rich flavor tastes like I accidentally dropped a caramel square into my tea. 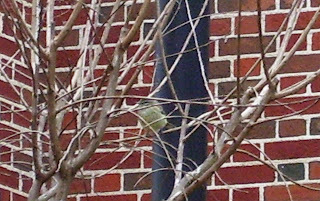 -The little green bird perched on a tree, and chirping happily as I walked by. -Sitting in chapel listening to the soul stirring "By the Waters of Babylon" played. It was sang as an African American spiritual by Sweet Honey in the Rock. Something about that song hits me deep. -The woman who smiled and chatted with me as she bought books in the bookstore. What a difference it makes to actually engage with someone you don't know, if only for a few moments. -A thought provoking and humbling conversation with Cheryl in the bookstore today about feminism across cultural and religious lines (and our very urgent caffeine run to Urban Grounds). -While babysitting Logan and her friend Lucy today, they washed handmade pottery in soapy water, and let their imaginations run wild by serving me gruel (yum) with marshmallows (i.e. soap suds) on top. The loss of imagination as we grow up is really one of the greatest tragedies in life. Imagining is such a refreshing and holy activity. 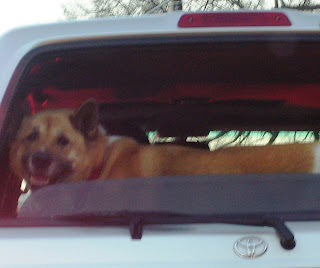 -The dog in the car in front of me that smiled at me as I drove home. -Drinking coffee from the great hobbitish mug my sister gave me. It's a delicious and whimsical way to start the day. 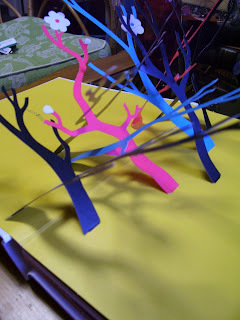 -An afternoon in the 60's that is either hinting or teasing of Spring. -Overhearing a little girl try to read the word "hug" by sounding it out very slowly. How exciting it must be to read a word like "hug" for the first time. -Having my usual night-before-classes-start dream last night. I always dream that I've waken up and gone to class (which in dreamland is dull) and then I hear my alarm, and realize I've been dreaming the whole time. It's a surreal sort of preparation ritual for each new semester. 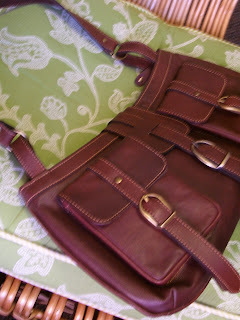 -Getting the great bag I ordered on The Hunger Site in the mail today. It's lovely and big, and fair trade too! I can picture it joining me on many travels. -Hearing "Waiting On The World To Change" by John Mayer on the radio at the exact moment that I was. I've decided I'm no good at waiting, and that the change I think the world needs is only going to happen when people stop waiting for it and start creating it (and I include myself in "people"). -Taking a couple of the Junior High youth to a movie last night. We saw Night at the Museum, and had a great time hanging out outside of church. -Entering my friend Ryan's birthday party late and solo, and having several people say "Whitney!" when they saw me. There's nothing like a warm welcome. 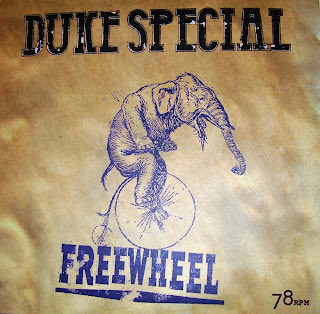 -Listening to Duke Special, my favorite performer from Belfast, and letting the memories come flooding back. -Waking up without an alarm, and feeling refreshed because I had all the sleep I needed. -Sitting with friends eating fish tacos, and thinking how great it is to see everyone again. Being apart from classmates makes me realize just how big a part of my life they are. 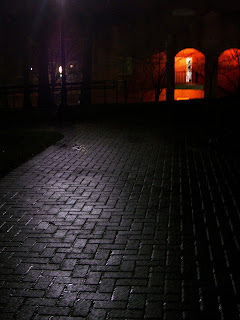 -The street lights creating a soft glow on the wet brick as I walk home.